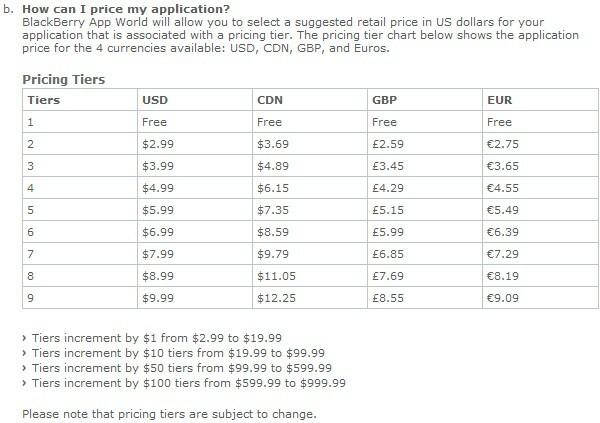 Okay, so RIM has dubbed their App store: Blackberry App World and the minimum price you can expect to pay is: $2.99. However, price would vary depending on which part of the world you are so if you're in the UK, expect to pay double the amount for the same app at GBP2.59. I really hate these different pricing schemes. I mean, what's the point? It's the recession and all, why would they expect Britons to pay more for the same thing?! Of course, I don't really know how the Blackberry App store would work, I mean, if I really want to save and pay in dollars, I can probably buy using a US hosted VPN, or ask a friend in the US to buy it for me, send the app to my email and install it manually. As for the minimum price, it's still a lot higher considering there are .99 cents apps in the Apple App store, let's just hope that for GBP2.59, Blackberry users will get a pretty darn good app and not some crap.